Acorns rank as one of the best wildlife foods. Yet while the stately oaks rooted in yards across our state have long been recognized for their beauty, their importance as a valuable food plant for backyard wildlife is still largely unappreciated. With more than 30 species of oaks native to the Peach State, regardless of where you live, there is an oak that will grow in your backyard. And acorns draw wildlife like a magnet draws iron filings. 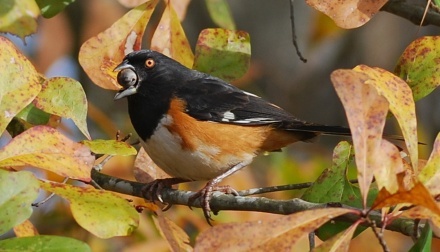 Approximately 150 species of wildlife eat acorns, a long list varying from white-tailed deer to eastern towhees (pictured). Read the rest of Terry’s column to learn which acorns wildlife favor, tips for planting oaks and more! Terry W. Johnson is a former Nongame program manager with the DNR Wildlife Resources Division and executive director of TERN, the Nongame Conservation Section’s friends group. Column archives. As winter approaches, migratory birds around the nation are acting on their instincts and heading for warmer climes. For young whooping cranes being reintroduced into the eastern U.S. by Operation Migration, however, the first trip south for these endangered birds requires a bit of human assistance. Using an ultra-light aircraft as a stand-in for a natural mother (video), Operation Migration has been leading young whooping cranes on their first southward migrations from Wisconsin to Florida since 2001. Depending on the weather, the flight can take from 44-100 days as it winds through a number of pre-set stops and flyovers, including in southwest Georgia's Clay and Decatur counties. Cranes that have completed the guided migration then make the journey unaided, choosing their own route and habitat for the winter months. Some young whoopers also are released to migrate with older wild cranes, a process called Direct Autumn Release. A number of birds migrate through or even overwinter in Georgia. But this week, 2014's aircraft-led flock of seven cranes had to take a new route. The cranes are bound for their winter home at St. Marks National Wildlife Refuge, just south of Tallahassee. This migration will bring the total eastern population to 104. The objective is to build a flock with at least 25 breeding pairs. The whooping crane, named for its distinctive call (listen), is one of North America's most imperiled bird species. Numbers dropped to only 15 during the 1940s due to overhunting and habitat destruction. 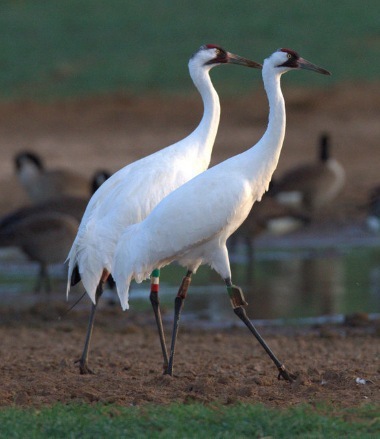 The work of Operation Migration is part of a larger initiative of the Whooping Crane Eastern Partnership, a consortium of agencies and organizations working to re-establish a migratory population in eastern North America. Operation Migration’s website features migration maps and timelines, as well as live camera feeds of the cranes in flight. There is also a listing of flyover dates and locations and a field journal blog. Nine whooping cranes have been shot in the eastern U.S., including three birds killed in December 2010 near Albany and two found dead later that winter at Weiss Lake on the Georgia/Alabama border. Dale Richter, board chair of Operation Migration and a business owner in Albany, said one of the cranes killed was a successful breeding mother. Richter attributes the shootings, which violate federal and state laws, to uninformed gun owners or vandals. Even approaching or feeding a wild whooping crane is strongly discouraged, as exposure to human contact diminishes the bird’s natural fear of humans, an important survival mechanism. Whooping crane sightings can be reported online. In 2008, Richter and his son Taylor, then 10, petitioned Georgia legislators to pass Senate Resolution 864, declaring November as Whooping Crane Month in Georgia. The resolution recognized the work of Operation Migration and the Whooping Crane Eastern Partnership to save the endangered species. Georgia is swimming in freshwater aquatic species. We rank in the top five states nationwide in the number of native mussels (127 species), fishes (265) and crayfishes (70). But there’s a downside: Georgia also ranks among state leaders in imperiled aquatic species. About two-thirds of our freshwater mussels are extinct, endangered or threatened with extinction. About 30 percent of our freshwater fish species and 45 percent of crayfishes fall into similar categories. Since 1998, DNR’s Nongame Conservation Section has worked through the Aquatic Conservation Initiative to determine the status of Georgia’s aquatic species and create conservation plans for those in decline. Developing 193 conservation status assessment maps to provide consistent information on rare species petitioned for federal listing and others. Reviewing with 40 experts the status and conservation needs of 251 rare species for the revised State Wildlife Action Plan, a comprehensive strategy guiding DNR and partners’ conservation efforts. Teaming with the Tennessee Aquarium Conservation Institute to survey South Chickamauga Creek near Ringgold, a hard-to-sample stream with rare species such as the snail darter. Exploring the status and distribution of imperiled mussels in the Apalachicola-Chattahoochee-Flint River basin, work that documented Apalachicola floaters in Lake Blackshear and the Flint. Completing a blackbanded sunfish survey with Valdosta State University that probed the species’ south Georgia range and discovered a new population ("Rare fish sought, found," July 12, 2012). 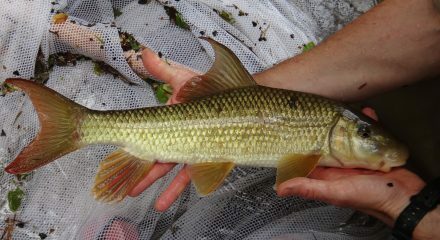 Monitoring sicklefin redhorse in Brasstown Creek with Young Harris College, research that recorded the most upstream record in Brasstown for this fish (below), a candidate for federal listing. Conserving Georgia’s fishes, mussels and crayfishes can save those on the brink of extinction, help keep others from reaching that point and preserve water resources they, and we, need now and for the future. Eagle and hummingbird license plates play a critical role in this effort. The Nongame Conservation Section receives no state funding for conserving aquatic or other nongame species. Wildlife tag sales and renewals, the agency’s number one fundraiser, provide direct support for projects and matching funds for grants. Without the tags, scientists working to conserve our rare aquatic species would be swimming upstream. Ask for an eagle or hummingbird plate. Pay the fee. 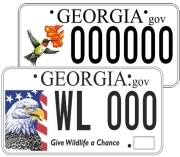 Wildlife plates cost only $25 more than a standard peach plate. The total cost is $25 for the plate, plus the standard $20 registration fee charged for all tags and any applicable ad-valorem taxes. Receive a temporary tag from the county. Watch the mail for your wildlife tag. It can arrive as soon as within a week! Buying a car: Many Georgia car dealers offer the option to purchase a tag when you buy a vehicle. Simply ask them to upgrade you to a wildlife tag when you're asked what kind of tag you want. Renewing: Got a wild tag? Keep it! Annual renewals provide great support: $20 of the $25 fee goes to wildlife. You can renew at your county tag office, or online in most counties. Renewing costs only $25, plus the standard $20 registration fee and any ad-valorem taxes. Most counties time renewals with your birthday. Burmese wild chickens in Fitzgerald are drawing new attention as the species, officially called red junglefowl, dwindles and scientists try to preserve its genetic integrity, according to Audubon magazine. Fitzgerald’s annual Wild Chicken Festival, a former rattlesnake roundup, celebrates the city’s free-ranging red junglefowl, remnants of failed government efforts to establish these poultry predecessors as a game bird in the South. Ticks and prescribed fire don’t mix. New research suggests that long-term burning significantly reduced tick counts on study plots in southwest Georgia and northeast Florida, chalking up another benefit for prescribed fire, a critical tool for restoring and managing fire-adapted habitats. 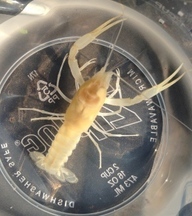 A Dougherty Plain cave crayfish has been caught in a monitoring well in Mitchell County, the first record of the subterranean species in that south Georgia county. Researchers contracting with DNR also recently caught two in Miller County, part of trapping to assess the status of the crayfish petitioned for federal listing (“Parting shot: Two rare crayfish,” Sept. 29). Three endangered mollusks with wild names are the focus of a finalized recovery plan announced by the U.S. Fish and Wildlife Service. Although they have vanished from 90 percent or more of their historical ranges, the interrupted rocksnail, rough hornsnail and Georgia pigtoe mussel are endemic to the Coosa River drainage in Georgia and Alabama, with the pigtoe also found in a Coosa tributary in Tennessee. A pathogen deadly to salamanders looms on the horizon. Following in the wake of the amphibian killer Batrachochytrium dendrobatidis (Bd), a related chytrid fungus, B.salamandrivorans has ravaged some European populations of fire salamanders and, while not documented in the U.S., could spread farther west through the pet trade, according to new research. Wood-duck banding went like gang-busters this summer. The effort by DNR’s Game Management Section project marked its second-best season since 1983, banding 596 wood ducks. Should there be a trout fishing season in Georgia? DNR’s Fisheries Management Section has scheduled two public scoping meetings to hear from the public about possibly about opening all trout streams to fishing year-round. Three pairs of red-cockaded woodpeckers were moved recently from Apalachicola National Forest in Florida to the Joseph W. Jones Ecological Research Center at Ichauway. The center in south Georgia’s Baker County is a charter member of DNR’s Safe Harbor program for endangered red-cockaded woodpeckers and has seen its population grow from one male in 1999 to 26 family groups, largely through translocating more than 70 birds. Four freshwater turtles native to the Southeast would be covered under the Convention on International Trade in Endangered Species of Wild Fauna and Flora (CITES) via a proposed federal rule. Common snapping, Florida softshell, smooth softshell and spiny softshell turtles are threatened by growing global trade in turtles, spurring the rule change aimed at improving monitoring, clarifying the legality of exports and helping determine whether more intense conservation is needed. Names in the news: The Georgia Land Conservation Program’s new manager is Fuller Callaway. Previously land conservation specialist for the Georgia Conservancy, Callaway will guide the program’s mission to protect Georgia land and water resources and provide financing to local governments, conservation organizations and landowners for permanent land conservation. Continuing through Nov. 14 – Joint Georgia and Southeastern Exotic Pest Plant Council annual conference and symposium, UGA conference center, Athens. Nov. 15 – Right Whale Festival, Sea Walk Pavilion, Jacksonville Beach, Fla.